Auto Meter Carbon Fiber Gauges deliver race inspired looks and functionality, suitable for any street or strip vehicle. Carbon fiber gauges have traditional incandescent lighting that illuminates around the perimeter of the dial and have a carbon fiber face with chrome trim ring. Race proven air-core instruments provide quick and accurate readings while withstanding the rigors of competition. 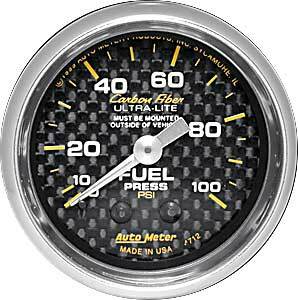 Auto Meter carbon fiber gauges are available in most popular sizes and readings. Dorman Products 25325 - Dorman Thread Sealing Tape 1/2" x 600"